August 16, 2018, 6:30 p.m. There is a racial gap in the United States when it comes to how Americans perceive racial interactions and racial protest. 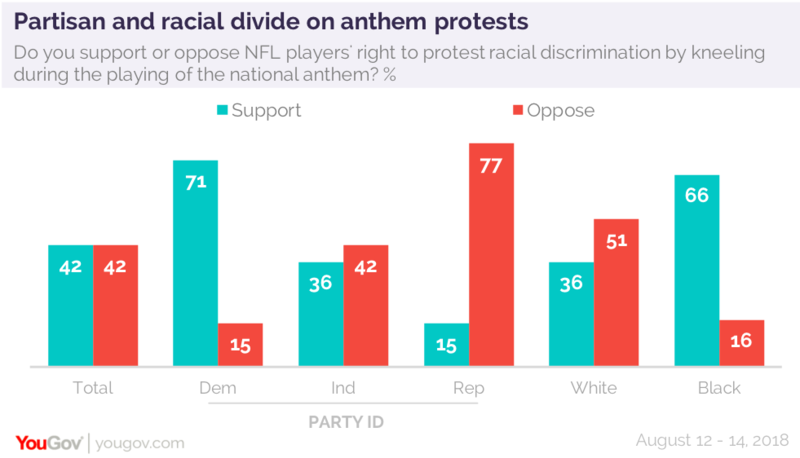 It exists in the latest Economist/YouGov Poll in the way blacks and whites describe the state of race relations within the country, what progress has been made, and their reaction to the proposed rules about National Football League player protests while the national anthem is being played. The NFL team owners voted last spring to allow players to remain off the field when the national anthem is being played, but to fine any player who came on the field and protested during the anthem. This policy (which the League has suspended while it negotiates with the players union) provokes a mixed reaction across party lines, as it did when it was first announced. But is there a right to kneel during the anthem? Republicans, who are divided on supporting the players’ right to be absent, see no right to protest by kneeling during the anthem. President Donald Trump has opposed the protest, by public statements and tweets. Two in three Americans recognize that the protests have been about race and are not a sign of patriotism, or the lack of it. But although whites and blacks agree that race relations are bad, there are large differences in whether they view racism as a serious problem. 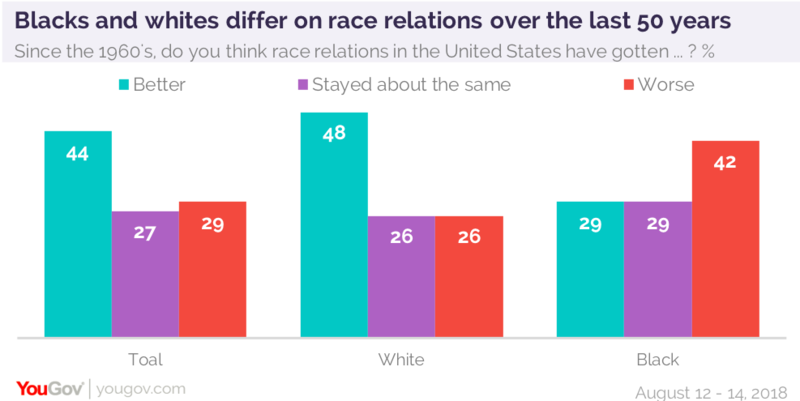 By 64% to 36%, or nearly two to one, whites say race relations today are bad. Blacks are even more likely to describe relations between the races that way. 76% of African-Americans think that, while just 24% think race relations are good today. 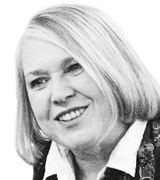 More critical, perhaps, is that whites and blacks have a different view of what has changed since the 1960’s and the height of the Civil Rights Movement. Whites say race relations are better today; blacks think they are worse. White Republicans, Democrats and independents give similar answers to this question, something that is not the case for other questions. For example, by nearly four to one white Democrats describe race relations in the country today as bad. White Republicans divide evenly: half say race relations are good, while half say they are bad. There are also big differences when the public is asked about racism. How much of a problem is it? Although most whites think it is a problem, just a third call it a “big problem.” That’s something more than half of African-Americans say. Three times the number of white Republicans as white Democrats say racism is only a small problem or not a problem at all.